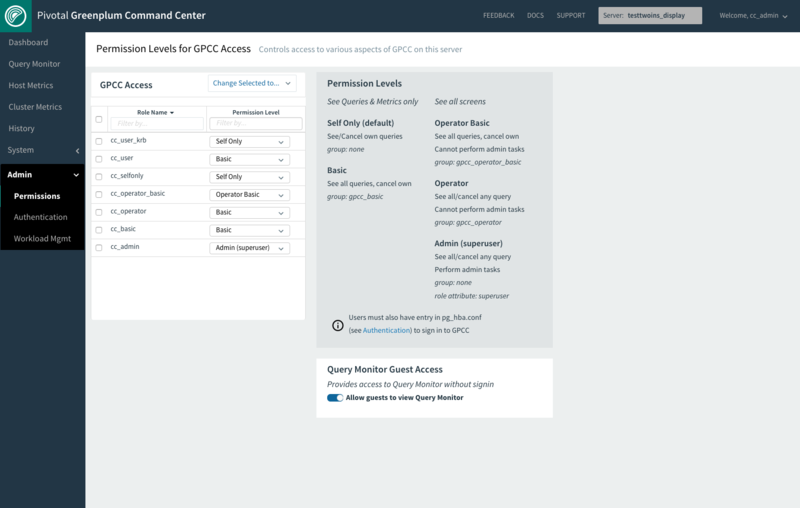 The Permissions Levels for GPCC Access screen allows users with Operator Basic, Operator, or Admin permission to view Command Center user permissions for Greenplum Database users. Users with Admin permission can set permissions for any user. Users with Operator Basic, Operator, and Admin permission can also see if the Guest Access to Query Monitor feature is enabled or disabled, and Admin users can toggle this feature on and off. Initially, all Greenplum Database login users are included in the list of roles with their current permission levels. To filter by role name, enter all or part of the user’s database role name in the Role Name field. The filter performs a simple substring search and displays users with matching role names. Click the Role Name label to reverse the search order. To filter for users with a specific permission level, choose the permission level from the Permission Level list. Role Name and Permission Level filters can be used together. To reset the filters, remove all text from the Role Name field and choose Filter by… from the Permission Level list. Users with Admin permission can change permission levels. Use the Role Name and Permission Level filters to display the roles you want to change. Check the box next to a role name to select the user, or check the box in the heading to select all displayed users. Select the new permissions level for each user from the list in the Permission Level column, or select a new permission level for all selected users from the Change Selected to… list. When enabled, the Guest Access to Query Monitor feature allows anyone with access to the Greenplum Command Center web server to click View Query Monitor on the Command Center sign-in screen and see the Query Monitor page without logging in. These anonymous users cannot cancel queries and cannot access any other Command Center features. When this feature is off, the View Query Monitor link does not appear on the sign-in screen and anonymous users cannot see the Query Monitor page. Command Center users with Admin permission can toggle the feature on an off with a mouse click. Users with Operator or Operator Basic permission see a message reporting if the feature is on or off.